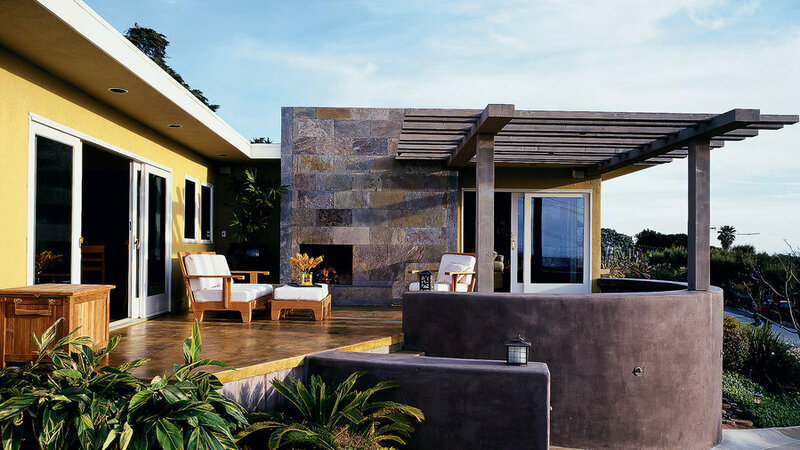 After the remodel the space functions as an outdoor magnet easily accessible from both wings and the street drawing the homeowners and guests to the new fireplace and the view. “When the weather turns warm, we eat outside next to a fire almost every night,” exclaim Dianna and Allen Nunez. The two have discovered that the best place for views of the Pacific coastline is right outside the front door of their one-story home in Leucadia, California. Originally, a small patio and a sloping garden filled the yard. The goal was to turn the area into a larger, more useful space for gathering and entertaining. The result is an open-air foyer and family room. Broad new steps lead up from the driveway to a nearly circular space that’s paved with stained and scored concrete and partially framed by an outdoor fireplace and an arbor. The old front door has been removed; the entrance to the house is through one set of sliding glass doors on the family room wing and another set to the living room. The door placement reinforces the perception that this space is itself the front entrance. Slate tiles cover both the front of a new fireplace and the brick of the old living room fireplace. The arbor includes built-in light fixtures that illuminate the dining area and the fireplace. On balmy nights, the owners can hook up a television to a cable outlet so they can enjoy watching sports under the stars.